Medley Movers – Moving involves a lot of stress. There’s so much to do and plan from packing all of your belongings to managing the transport and moving your things in. Let Discount South Florida Movers help you. We have been helping people in the Medley area just like you for over 15 years. We guarantee that you will satisfied with our team of professionals as they assist you in all facets of the move. Whether you are moving an office or a home, moving near or far, we can help you. Our experts can move anything including specialty items such as pianos. If you have special requests like moving at night or on the weekend we can accommodate you as well. No matter what you need moved or where it’s going, Discount South Florida Movers can do it and at rates that are the lowest around. Medley is an industrial town in the western part of Miami-Dade County. Despite its larger size and location on the Miami River, the town has a population under 1000. Even with that few a people, the residential areas are still densely populated due to most of the city being zoned for industrial purposes. It’s central location and proximity to other major cities has led to the city becoming an industrial center. The town is home to many factories and plants. One of the largest building materials companies in the world, Rinker, has a plant in the town. Also located there is the Titan American Pennusuco Cement Plant. That revenue for the town comes mainly from these industrial companies. 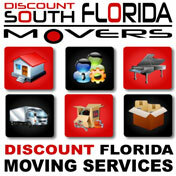 Discount South Florida and Medley movers provide low rates on residential, commercial, piano and long distance moving.